We are on the verge of Christmas, the most widely popular festival in the world. This is the time of the year for which each individual wait for a complete year. But when the wait is over, you will find that one more year of your lifespan is over, and so it must be celebrated magically. Usually, people celebrate the Christmas season with their families and loved ones. You invite them to your house. But now another thought comes to your mind with so many people coming to your house; your home certainly needs to look apart so that everyone who visits there feels the glow of your innovative decoration. This can be done by only one way, and that is to make way for the magic of Christmas to enter your home and your heart. 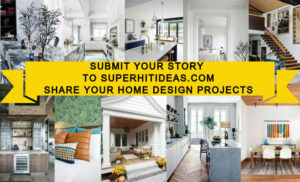 But there is no such thing like magic which can decorate your home, you have to do that yourself, and for doing that, you need some great ideas to follow. For your help, we bring 21 best ideas using which will help you to create a Colorful Christmas Décor and your house will look glorious. Make the decorations more colorful by adding more colors to your living room. Attach a string of colorful balls over the fireplace with glittering lights attached to it. A colorful painting in the room will also increase the feel of color. These colors will be more evident only if the wall and the other furniture in the room are of white or any other very light color. You can put a garland of leaves over the window to give it a cool look. Additionally, you can keep some vases over the fireplace but must be white in color. The same applies to the papers using which the gifts are wrapped. The tabletop where the family members sit and enjoy their Christmas must be decorated to such extent that the magic of Christmas is never out of your brains. For that, you can put small Christmas trees on the table which must be of different colors. Use colorful plates to add more to the tabletop theme. Beside the table, you can put a white Christmas tree with glittering lights of the same color attached to it. You can also attach toys and balls of different colors to the tree to make it more colorful. This festive season spread some colors to your kitchen as well. Try to color or keep the cupboards and walls white so that any added color will now make the kitchen colorful. In the table in the middle of the kitchen, you can put some small Christmas trees made of plastic. They can be of various colors. You can add some light colored lights in the kitchen too. Try to keep the utensils or appliances of different colors on the top which will help you create a Colorful Christmas Décor for your kitchen. One of the most beautiful color combinations is without any doubt the mixture of purple and red, which will add a new dimension to your list of Colorful Christmas Décor. Put a Christmas tree on a corner of a hall and decorate it with purple ribbons and add white and red balls to it. Finally, when you add the glittering lights to it, it will really take you to the dreamland. Additionally, you can place gift boxes in nearby tables wrapped in multicolor paper. The get the focus on the tree, put in a room where the walls a colored light. When we are talking about colors, why would we miss multicolor. A whole Christmas tree in multicolor is certainly a treat to watch. You can roll differently printed cloths and add them to make the tree. You can also roll them over small sticks to give them better stability. Now when you are making this tree with colorful clothes, don’t forget to add toys which are also multicolor. To add more to the theme, you can put a multicolored painting in the room or keep chairs with multicolor cushions on them. Adding a few colorful lights will also do. Another thing which is widely used all around the globe not only for Christmas but for many different festivals is the peacock feather. You can make some boots with a green colored cloth. Add peacock feather to the lining of the sock. You can hang it over the fireplace to make the place look adorable just as the peacock. You can also place several peacock feathers over the fireplace just like that. Try to keep the surrounding as green as possible so that the theme looks more effective. No wonder why the peacock feather is regarded as one of the most popular Colorful Christmas Décor. You can make the table decoration an extremely fun activity. Place some leaves on the table and over them put a few glasses or jars. On those jars and glasses, you can put some colorful balls. Make sure this time that the surroundings are black so that the theme can work more effectively. Mean to say black glasses, black chairs, etc. To bring a certain contrast to the theme, place the table in a room where the walls are white or of light color even the windows and curtain on them must be of light color if not white. Fill up the fireplace with paper made balls of different colors and sizes. Color the walls or surroundings in white to make the colorful theme more visible. Over the fireplace, you can put a couple of portraits or a couple and a couple of small Christmas trees with multicolored boots hanging from them. Standing on a wooden floor, when you will look at this decoration your heart will certainly be filled with joy. There may be a lot of different themes which will attract people, but this one belongs at the top without any doubt. 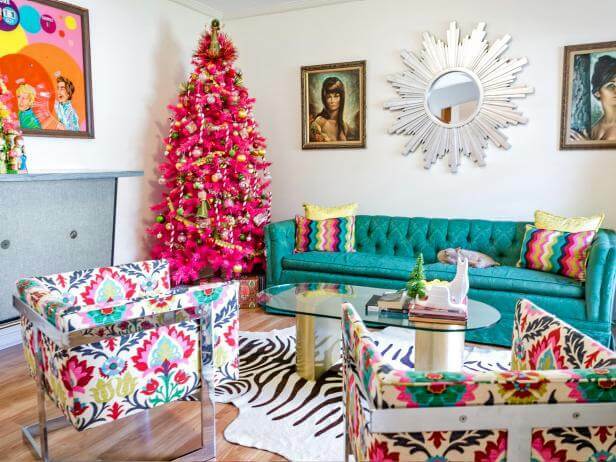 Give your house a cool retro look this Christmas. Put a Christmas tree on a table beside your long bookshelf with colorful books in it. The white-colored Christmas tree must be decorated nicely with colorful toys and sweets. Add a few light bulbs to make it look more glorious. You can also hang a string above the tree with colorful toys hanging from it. Keeping a wooden chair beside the tree is another great idea with soft and fur made cushion on it. Don’t forget to put some showpieces and small Christmas tree over the bookshelf for a classy retro look. You will agree with me that kids are the most important part of any family. So, why not decorate their room this festive season in such a way that they would really love and boast about it gleefully to their friends. Decorate the shelves in their room with colorful items like bowls, trays, and boxes. You can always add a few colorful paintings on the wall to bring more color to the room. Lastly, put up a nice Christmas tree on the center of the room. Add colorful stars, alphabets, and snowflakes in it to make it beautiful. Never forget the big star on the top of the tree and the glittering lights which will keep the tree alive. Another color combination which not only soothes the eyes but will make your decoration look apart is the combination of blue and purple. You can start decorating using the theme by first painting your room to blue. Keep the dining table in the center of the room with chairs colored in purple. You can add a few glasses and paintings on walls with golden frames and a garland over the door too which must have a mixture of golden and purple. Put a different styled Christmas tree beside the dining table. It must look like a big gift wrapped in blue and purple pieces of cloths with golden being the third color. Add lights, hand toys, and put gift boxes below the tree to make it look more interesting. Ready to Decorate your Living Room with Christmas Tree? You can use a combination of blue and white this time. In a white painted room try to put the furniture colored blue. On the walls, you can hang a few colorful paintings along with snowflakes of different colors. Beside sofa, in a corner put a decent sized Christmas tree with the white and blue base. Decorate the tree with toys, balls, candies, and glittering lights to enhance the beauty. Keep gifts below the tree wrapped in blue paper to make the decoration complete. One of the most Colorful Christmas Décor is making your fireplace look like a rainbow. Make it so colorful that visitors can stand there for a long time and check out the decoration with their mouths open in wonder. First, wrap the fireplace with colorful toys, balls, and ribbons. If possible add a few colorful lights too. Now, put another colorful Christmas tree beside it to create a perfect theme. Attach multi-colored toys, candies, ribbons, etc. on the tree along with wires of glittering lines. Now, light up the fireplace, sit beside it and enjoy the view. Just as the wonderland, you can create an own candy land for you. Create a Christmas tree completely with candies all over it. You can add a few toys and houses made of candies too. To decorate the room, you can hang leaves over the windows and add strings of candies there as well. Make this festival happening by something new and innovative, and this one is certainly one of the latest ideas. Decorate your living room just like a rainbow can be a great theme this year. Add white colored furniture in a room whose walls are painted in different colors just for example you can use blue and white as colors. The cushions on the sofas can be of various colors with Christmas tree drawn on them. In one corner, put a Christmas tree in white and add colorful bulbs to it. You can always add a few golden ribbons and snowflakes to it. On the walls, you can hang a couple of multicolored garland beside the tree. You can also put gifts wrapped in different colored papers below the tree and on the table with a few multicolored alphabets. The front door decoration is very important as that is the place from where the guests are going to enter. Put a garland of multicolored balls in the center of the door. Hang leaves above the trees and add lights to all the nearby plants so that the whole thing will look out of this world when people will visit there at night. Put a nice welcome mat below the door, and you are all set for the big season. First, you need to paint the whole fireplace area in white to make this theme work. On the shelf over the fireplace, put a few books, sweets, toys, glasses and jars with candies in them. Hang a string over the fireplace with something beautiful written in it with candies. For example, you can write JOY. It will look more interesting if, above all on the wall, you can put an artificial dear head with the mouth painted white and horns golden. Decorating a Christmas Tree Well is Very Important as can affect your whole theme. If the tree is not decorated well, a perfect theme will look extremely absurd. Put the Christmas tree to a corner beside the fireplace. Decorate it with toys, balls, and lights of different colors so that it looks like a rainbow. Keep a few gifts below it wrapped in papers of different colors too. You can hang some Santa boots over the fireplace along with a string of light and leaves. The front door, once again the center of attraction is here with yet another theme. Post a big lantern over the door with burning candles or light. Surround the beautiful glass door with garlands made of toys, balls, and ribbons of various colors. Add a few sparkling lights to give the whole theme a new colorful look and wait for the guests. A Christmas tree made of paper ornaments, isn’t it a cool idea? Along with lights and candies, you can decorate the Christmas tree with different paper ornaments in different colors. Keep it beside the window so that people can view the charming tree from the outside as well. Place a few gifts below to make it look perfect. Finally, once again to the most important place of your house, living room. Make the living room colorful with colorful furniture. You can obviously put a few portraits and colorful paintings on the wall to increase the colorful look. Put a pink Christmas tree in a corner attached with lights, toys, balls, and candies of different colors. Keep the color of the room white or any other light color to make the theme more prominent.